CBSE Class 12 Admit Card: The Class 12 boards are one of the most popular board exams in India since they are conducted on an all-India level. 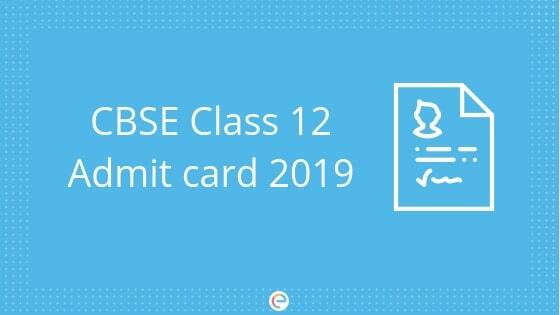 CBSE Class 12 Admit Card for the year 2019 Board examination will be released soon. A total of 11.86 lakh students registered for the 12th board exams last year. This time the entire schedule has been preponed by at least 15 days. It is important to the student that they are aware of the exam date and also collects the admit card before the examination. However, regular students will get the admit card from the school since the school authorities fill the students registration form. But those who are private students and have filled the online registration form are required to download the admit card from the official website of CBSE. We suggest that you keep the board exam hall ticket secure until the results has been announced. More details regarding CBSE Class 12 Admit Card are given below. Pass marks for each subject is 33%, and you are required to pass in all the subjects, Theory as well as Practical, separately. In case you are not able to get 33% marks in one subject but have got more than 20%. Then you are required to reappear for that subject for in the compartment exam that will be conducted in July. And if you fail again then a second chance will be given where you have to write that subject paper in the annual exam 2020. Here are the steps that you need to follow once the admit card to be released by cbse. Choose the Search By as required and enter your details in the box. Take a print of CBSE Board 10th Roll No Hall Ticket pdf file to attend the 10th Public Exams. Every year, CBSE 12th Admit card is released before one month of the examination. It is expected that the Board will announce the CBSE Class 12 Admit Card 2018 in last week of January on the official website of CBSE before the examination. Students must keep in mind that CBSE Admit Card is very important for all candidates who will be writing the CBSE board examination. Candidates failing to produce proper Admit Card will not be allowed to enter into the examination hall. We hope that this detailed article on CBSE Class 12 Admit Card helps you. If you face any issues regarding the CBSE Class 12 Admit Card or anything about the exam in general. Then you can drop down your queries or can post any comments in the comment section below. We will get back to you at the earliest. Person who is a not a regular student (failed or a teacher or a women candidate or a physically handicapped) and is eligible by law to undertake the cbse board exam. There are a total of 21157 schools that are under cbse. In order to identify each schools, cbse assigned every school a affiliation code. Is Ncert is sufficient for class 12? Yes, NCERT Textbooks are enough if you know every bit of it and also strong with all the concepts that are their in NCERT books. However we recommend that you also go through the reference textbooks. Will online pdf admit card work if school is not issuing the admit cards? Yes it will.. you can download from online, if school is not issuing the admit cards. You must have received an email/sms that has your User ID and Password after your application was completed. If your school did the application for you, you’ll have to contact your school authorities for the admit card. If their is any mistake in admit card of 12 cbse2018. Can it be corrected now ? Please contact your school authorities and they will guide you through the same. I’m in 12th class now and it’s feb now and i have still not got my registration done from school is their any chance now that it will be done???????? Please clarify, are you still in your 12th this year or are you appearing for your 12th boards this year? I suggest you contact the CBSE helpline number directly. They will be able to help you. Hello my name is vishal and in my 12th class admit card has an issue of photo can it be solved? What is the issue with the photo? hello sir, my name is prasanna and i have registered my name without my father in admit card but in my adhar card my name is with my father name.Is there will be any problem in upcoming entrance exams? Please contact with the board for the correct information. Please contact with your board to know what to do regarding this. Hi Aryan, Yes you should register for second chance compartmental exam and once you register CBSE board will provide you new Admit Card. In order to clear your subjects you should be thorough with the syllabus and prepare hard. hello sir, i am a private candidate and filled improvement exam for class 12th and i cannot download my admit card . when i click on proceed it always shows the service is unavailable .so what should i do sir? I suggest you check the website after some time. If you still face the same issue, please contact the official authorities for the same. Try downloading the admit card after a few days. We cannot do anything regarding this matter. The only thing we can do is to suggest you to contact the official authorities. Have found one of the major issue, my brother who will be appearing for 12th CBSE board exams, in his admit card released CHEMISTRY subject is missing. Kindly help what further process can be held to make changes. Hi Asha, Contact officials for this concern. Hey Gaurav, kindly contact the officials for this issue. For Regular candidates, the class 12 admit card will be distributed by the school officials whereas private students should download it from the official website. Hey, Kindly contact board officials for this concern. Please contact the official authorities. You need to contact the official authorities and let them know about the mistake that has been made in the name. I would like you to say that for queries like this you are always required to approach the official website.